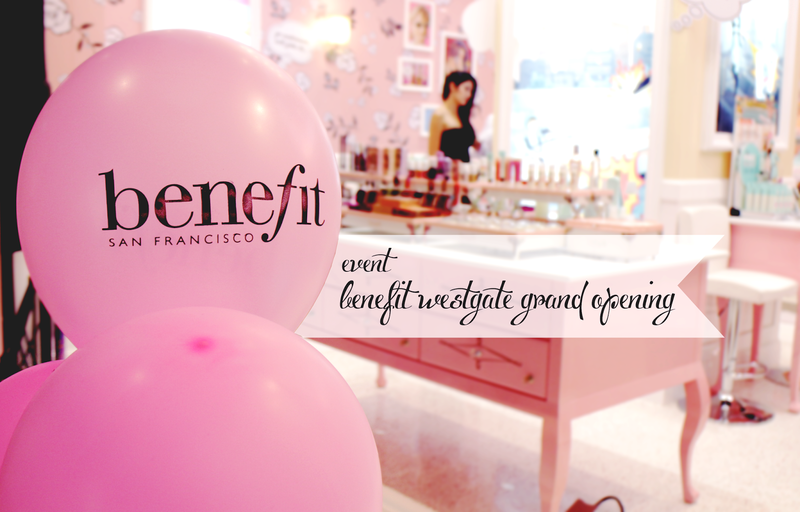 Benefit Cosmetics, the source of a couple of my favourite makeup products has just opened up their first ever store at Westgate mall and we were so thrilled to have received a personal invite to attend their grand opening a couple days ago. 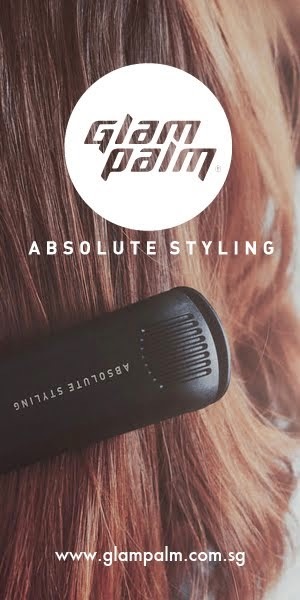 If you follow us on instagram (Which you totally should! ), you would have seen the sets of photographs taken from the evening but of course, nothing like a post to go with it, am I right ;)? Before I get started with the post, a couple of you might be wondering, where did Sam go?! As much as I wished she could have been there with me, she had a family matter to tend to and family means a lot to both of us, so unfortunately, she couldn't be there. Nonetheless, I called her to gush about the event right after (isn't that what all best friends do?) Anywho! on to the post! The opening definitely caught a lot of attention from the people roaming around Westgate mall. The benefit team was decked out in costumes (ps. can you spot their mascot, simone? ) and local youtubers, Munah and Hirzi were the emcee's for the evening! After a short dance number from the lovely Cabre dancers to the benefit theme song, was the official ribbon cutting ceremony. 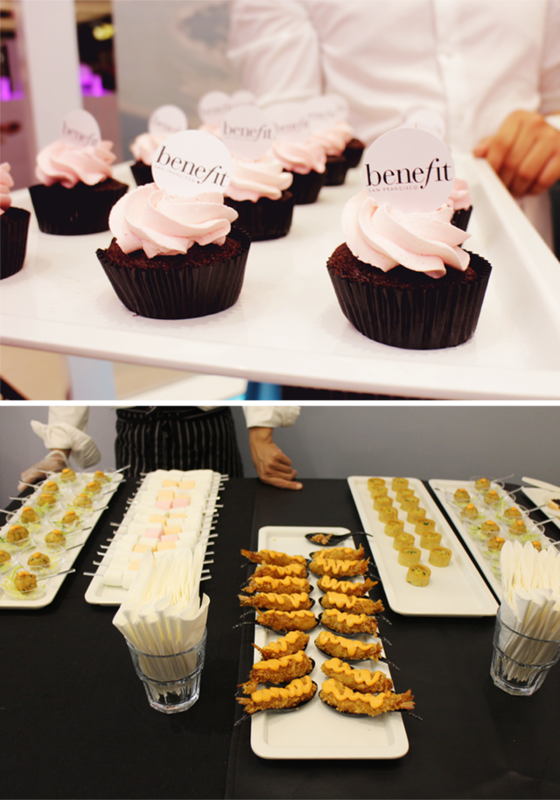 Of course, there's no missing the food table that was present at the event! Although I didn't have the time to indulge in everything that the table at to offer, here's a little look at what us hungry blogggers and influencers fueled for the night! Westgate mall, in general is like an export of all the shops that you'd find at Orchard (Topshop, H&M, even Kate spade Saturday, Tim Ho Wan etc..) imported to the west! It's definitely more convenient (for me especially) if I want to make a quick retail therapy trip and don't want to clash with the town crowd, and it's not more than 30 mins from where I stay! The Benefit store is on the 2nd floor of Westgate mall. There's no missing it once you exit it to Westgate mall from the MRT. All you have to do is walk all the way to the end and locate the store #02-15! Let's just stop for a second and admire how pretty and girly the interior of the store looks. It's definitely a every girls dream of what a makeup store would be, down to the girly chic wallpaper! The vanities within are decorated with all the Benefit products that you could ever think of, their skincare line, lippies, lashes, and other iconic makeup pieces that makeup the lovely brand. 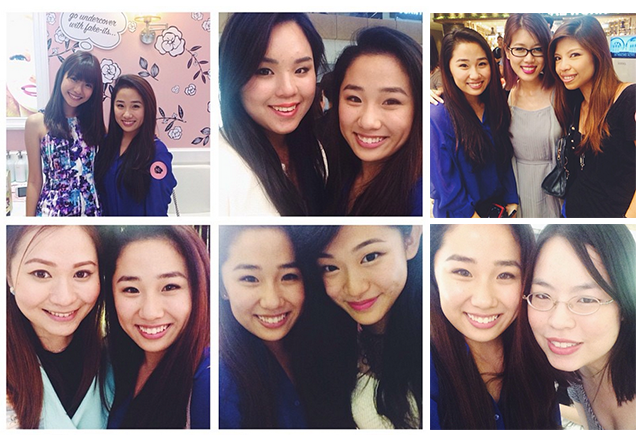 One of the best parts about attending events would definitely have to be getting to meet and see familiar faces! Everyone was so sweet and super outgoing and it was amazing to have made new friends as well :) It's just so nice to be able to talk about things that we're all passionate about and be able to relate to one another on so many levels! 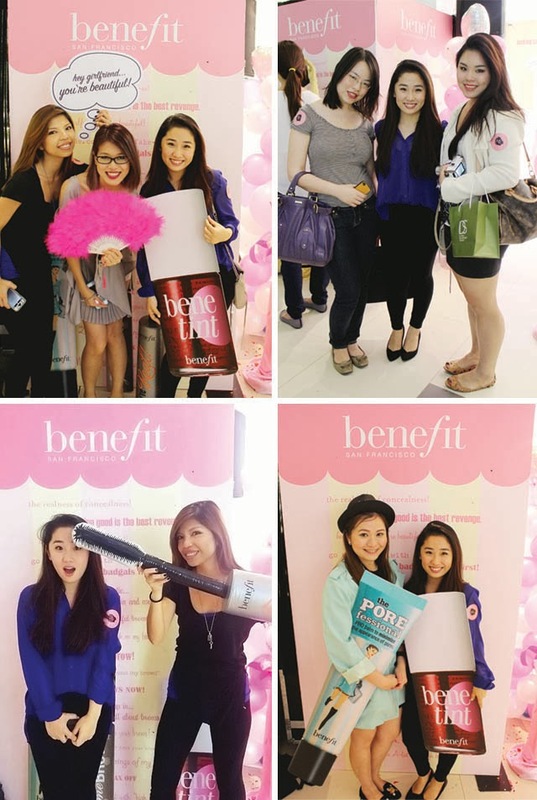 There was also a little photo section where we got to take photographs with the "full size" Benefit beauty products! Mabel (sheshopsmakeup) and I even tried to renact the commercial that Ellen and Sofia Vegara did with the covergirl Das Bombshell ad! Thank you so much to Benefit Singapore and Mei Ting for inviting us! 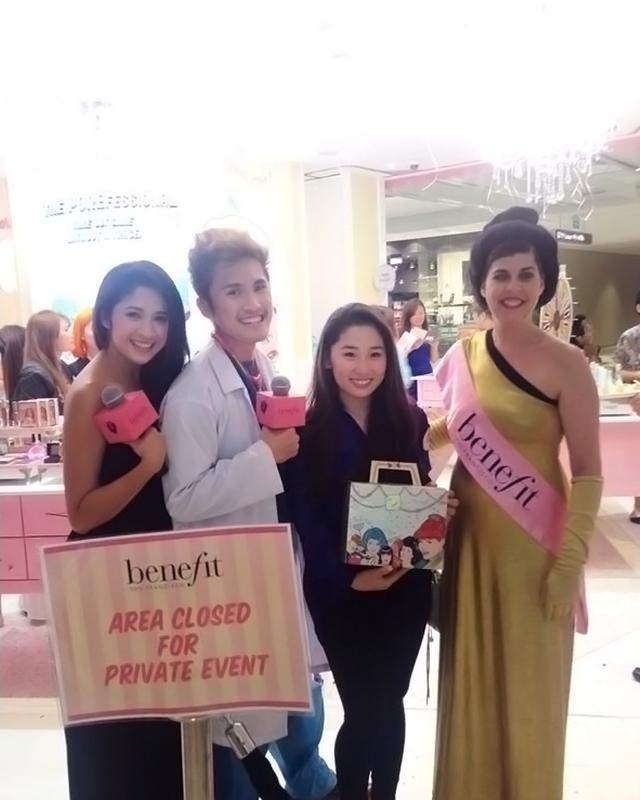 I had so much fun at the event getting to know not only the other bloggers but also meeting the benefit team! Hi to Amber and Constance if you're reading this! 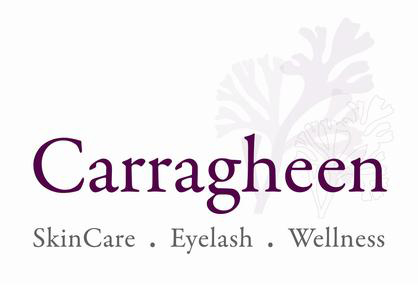 Congratulations on opening your first ever boutique here in Singapore!